What I’m enjoying the most now is: Photography. Do you remember those days, not so long ago, when we had to take our photo reels to the photography shop to get our pictures developed? I hated those waiting days… yes, days!!!! Can you imagine? And now, you want it, you have it! I know I still have much to learn; I’m an autodidact and these things take time and practice… but looking back to my first pictures in this blog, you will see the difference, I can’t help it, I feel kind of proud… my pictures have improved. So, when I noticed Zorra’s event, I thought… hey, this one is for me! Come join me and send your pictures over, it will be fun! Just follow her instructions at 1x Umrühren Bitte and share your tips on Photography :D.
Here is the deal: Post the before and after picture and mention how many “botox” you used ;D. For example, take these 2 pictures: the one in the left is the before one and the right is the after one. Notice the differences? This is what I did: First of all, opened the picture from Photoshop and reduced its size. If you are not planning to print the pic, then 72 pixels/inch resolution is perfect. Also, I re sized it 400 pixels width. Saved 2 pictures out of it: a and b. Went to Picasa 3 and edited b. I clicked the “I’ll be lucky”, I also gave some colour temperature and sharpened the image. The following pictures have been arranged with the I’ll be lucky tool, the light tool and the sharpening one depending on their initial characteristics. My camera is a Nikon D40. All these pictures were taken with the 70-300 mm objective and I used the macro function in some of them. All photos come out in Jpg format, 2256×1496 pixels. My camera has the Raw format but I have never used it yet. The following pictures are only the “b” ones. Picasa 3 is a free software which allows you to play and arrange your pictures, upload web albums and more. My advise is: go and get it! Follow this link to see this recipe’s web album (full size). This is also my entry for Priya from Priya’s Easy N Tasty Recipes as she is being the host this month for the Event: FIC – Pink/Rose. 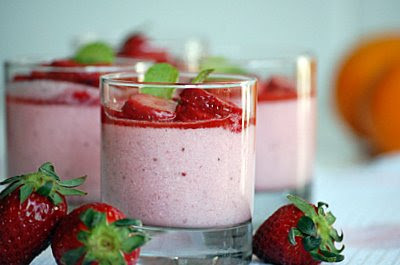 I know, I know, strawberries are red but what happens when we mix them with some mascarpone? 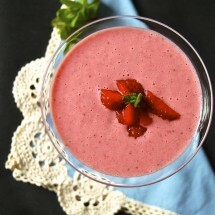 Yes, that’s right… we get a Pink mouse ;D. You can also find the instructions for the Event at Tongue Ticklers, Sunshinemom is waiting for more pink entries ;D.
So finally, here is the recipe for this fresh and pink strawberry dessert: Strawberries Mouse. Good bye winter! Welcome Spring!!!! 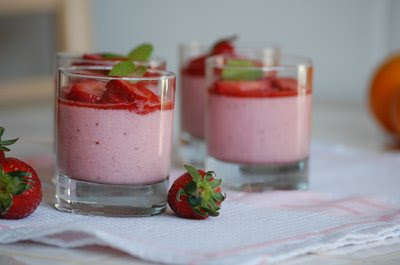 Ingredients for 4 servings: 150 grs of Mascarpone, 250 grs of Strawberries + 50 more, 25 grs sugar, 2 sheets of gelatin, 4 tablespoons of fresh and natural orange juice, 1 teaspoon of grounded white sugar and some mint leaves. Dive the gelatin sheets in some water. Squeeze and pour in a pot with 6 tablespoons of water. Heat it and when the gelatin dilutes reserve. 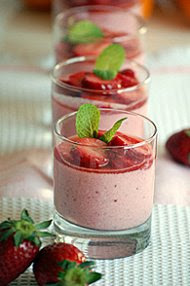 Take the cleaned and chopped 250 grs of strawberries and blend. Add the mascarpone, the gelatin in water and fill up the four glasses. Place in the fridge for minimum 4 hours. Clean and cut the 50 grs of strawberries and saute for 1 minute aprox. in a sauce pan with the orange juice and the white grounded sugar. 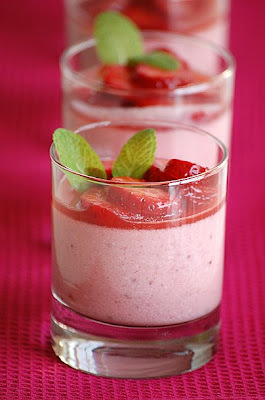 Take the glasses out of the fridge, decorate with this mixture on top and place the mint leaves. Serve immediately and enjoy! Nuria – You have every reason to be proud. I’m pretty sure I commented a couple of months ago about how interesting your photos were becoming. You did a really great job here. The dessert may be eaten and forgotten, but the photo lives on! …and, as usual, you are so generous to share your knowledge. I completely understand about photography being addictive Nuria…and you have done a beautiful job with processing the pics. Maybe one day you will use the raw format? A lovely colourful dessert too! What would the Spanish word for the gelatin used in the recipe be? It’s easier to look for it that way in the supermercado. By the way: I bought a pack of meat specifically for “Arroz al Horno” at Mercadona…I’m going to give it a try!! Thanks for the inspiration. I think all of your photos are lovely – even the “before” shots! That strawberry mousse is certainly a very photogenic subject too! It looks wonderful! Hola Núria!! Acabo de descobrir el teu blog i és fantàstic!! Felicitats per aquestes fotos magnífiques (i receptes)!! I aquesta mousse, la provaré aquest mateix cap de setmana! 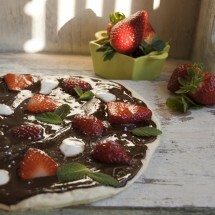 OH Nuria…what a fab dessert & what a fab lesson. I’m still an auto addict & I love Picasa to bits. One day I shall too reach the raw format, shall move to av/manual modes, & feel good about doing more with my precious camera. Your pictures rock!! I need to buy a new camera. I use a compact camera so there’s not much to do. Your pictures are however very beautiful so is the dessert. That looks wonderful Nuria. Thank you for the Picasa tips–you know I wasn’t using any editing software except the Picnik every now and then, but I am beginning to think I should be using somehting more. Yes, welcome Spring and welcome strawberries! Yummy!!! 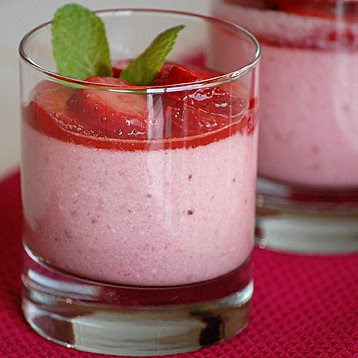 That strawberry mousse looks really good! Nice photos! Núria, me too I’m an autodidact and it’s form blogs like yours we get our inspiration. Thank you very much for your participation and for the delicious recipe. It comes on my to-do-list. Thanks dear Joan! The dessert came out beautiful and sharing the tips on photography was part of the deal for the Event :D. Enjoy your weekend!!!! Hola Peter, do you use the raw format? what advantages dissadvantages has? Hi Jeff and Valerie! Gelatin is Gelatina and there’s different formats: sheets, power envelopes, with fruit flavour, etc. I used the sheets with no flavour in this one. Good luck with your Arroz al horno, hope it comes out wonderfully!!!! Hola Susan! I just noticed I called my dessert Mouse instead of Mousse… Ai, ai, ai. Never mind… thanks for your kind words Susan and enjoy your Sunday :D.
Hola Merçé i moltes gràcies per les teves paraules!!! Espero que tothom es llepi els dits ;D. Bon cap de setmana! Thanks sweet Deeba! I bet there’s not much for you to learn in Photography ;D. YOur pictures are one of the most beautiful in the blogosphere!!!! Thanks so much Ivy! Maybe your family surprises you for your birthday or Mother’s day with a new camera? Don’t know in Greece, but here and due to the crisis, many products are lowering their prices. Hola Maria! I guess that depending on the camera you either have or don’t have some functions. For example, my camera has the Raw format as well as the Jpeg. These formats show the quality of the photo (there’s 3 jpeg levels: fine, normal and low). As I said I also have the raw but never used it. I guess it’s a more complete format, it includes every bit of information. The jpegs tend to reduce the picture not to make it too heavy. If you want to know more about it, I think that Zorra’s round up will be very instructive :D.
Also, Av/manual modes means that you can switch your camera from automatic to manual. If you switch it to manual then you can graduate the light, distance and so yourself. 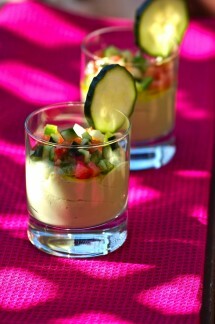 Thanks for the wonderful tips on photography Nuria andf also for the many beautiful photos of this delectable dessert!! Great post and thanks for the tips, that’s what i need. I got my first SLR last Fri. Glad to hear you are Nikon user too, mine is Nikon D90. Very happy to it but a lot to learn. Nuria– you are a photography wizard! All your photos are beautiful. I love this strawberry mousse– so pretty! You seem to have a real gift for creating the perfect photos. I have never learned how to use photoshop, so I am amazed by your knowledge! 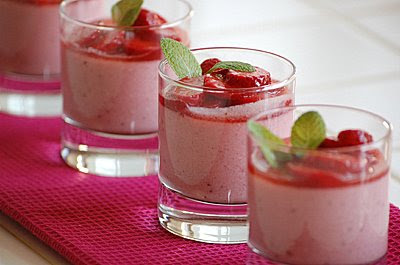 Loved those pics as well as the mousse. At times use the Gaussian blur in photoshop to highlight the desired portions of the pic, it looks good that way. < Is Little Red Ridding Hood lost in the WOODS? Click it!